The Portuguese were the first to arrive in India. Vascodagama's sea-route opened the way for the colonization of India. He landed in Calicut in 1498 with a fanatical zeal for the Catholic religion and established his fort in Cochin. The Dutch put an end to the Portuguese colonization by capturing Fort Cochin from them. The French continued the commercial career with Pondicherry on the Coramandel coast as the center. In course of time the English East India Company chartered in 1600 established their settlements in Madras(1639), Bombay(1668) and Calcutta (1698). The French also established trading post in Pondicherry near Tamilnadu and the Portuguese in Goa, but they did not depart even after the British have left India. By the beginning of the 19th Century, the Company regime was firmly entrenched in India. Governor General, Wesley's Forward Policy and Subsidiary Alliances and Lord Dalhousie's Doctrine of Lapse and Annexations and the introduction of greased Cartridges which hurt the sentiments of the Hindu sepoys all precipitated into " The Great Mutiny of 1857 " called the First War of Independence. Energetic leaders like Tantia Tope and Rani Lakshmi Bai of Jhansi created immortal Epics of courage and Self-sacrifice. The death of the East India Company announced in 1858 by Queen Victoria signified the end of major conquests and the beginning of an era of responsible colonial Government in India. Lord Macaulay was responsible for the introduction of English education in India but it had a Professional goal. The British interests in trade and profit resulted in expansion of iron and coal mining, the development of tea, coffee and cotton growing, the construction of India's vast network of railways and also massive revolutions took place in the field of agriculture too. Many social reform movements cropped due to this education. The BRAHMA SAMAJ founded by RAJA RAM MOHAN ROY fought against SATI, the inhuman practice of burning the wife in the funeral pyre of her husband. The Theosophical Society in Adayar, Madras founded by ANNIE BEASANT championed the cause of home rule in India. SWAMI VIVEKANANDA, the man with a modern vision founded the Ramakrishna Mission for world wide missionary work. Sree Narayana Guru of Kerala fought against the caste system especially in Kerala. By the end of the 19th century there were a number of organizations in different parts of the country engaged in reforming the country and rejuvenating the Indian culture. A.O.HUME, a retired English civil servant founded the INDIAN NATIONAL CONGRESS IN 1885. Later in the Surat Conference of the Congress there developed a cleavage between the moderates headed by GOKHALE and the extremists lead by TILAK. With the new leadership of GANDHI at the end of the world war, the Congress became more belligerent. Equipped with a Degree in Law from England, Gandhi was able to kindle a mass movement in India.He established ashrams in SABARMATI and WARDHA to follow his swadeshi ideals. Jail -going for breaking the British law became a respectable thing for the Indians. The JALLIANWALLA BAGH massacre in 1919,the DANDI MARCH in 1935 for making salt and the QUIT INDIA MOVEMENT in 1942 were some of the highlights of the freedom struggle. World war 11 brought about a great change in India. There was a powerful national upsurge, since the Congress exploited the problems that the British Empire faced due to the world war, to demand a definite promise of Independence. Following the end of the war in 1945, the British took steps to grant INDEPENDENCE in 1947.The British Empire was completely shattered after the war and their first priority was restructuring their own economy, which was in shambles. The entire nation saw it as the victory of the Gandhian strategy of NON-VIOLENCE. But it was a mixed package since the freedom at midnight was tied with the partition of the country under communal lines. Large-scale communal riots broke out in both the countries following Independence. Then followed the tragic death of the great Mahatma in the hands of a Hindu fanatic, which marked the end of an era of unity and idealism. Then Ambedkar framed the constitution in 1950. A lot of economic progress was registered with Nehru as the Prime minister through the FIVE-YEAR PLANS. Later the Congress gave great emphasis to the Parliamentary system with a multi party system. During the cold war Nehru framed a cautious neutral foreign policy. There were clashes with Pakistan in 1965 and in 1971, over the intractable Kashmir dispute and the other one over Bangladesh. A border war was also fought with China in 1962 in the north Eastern Frontier Agency. India continues to dispute sovereignty over these areas still. India's main problem is the personality cult it has developed with its rulers from independence. There had been three Prime Ministers, Nehru, his daughter, Indira and her son Rajiv. Indira won the 1966 general elections but faced serious opposition and unrest in 1975, when she was forced to declare an emergency. During the emergency, Indira was able to control inflation and boost the economy and increase the efficiency. On the negative side, political opponents were sent to prison. India's judicial system became a puppet in her arms and the press was also fettered. In 1977, another general election was called for. The Congress party led by Indira was bundled off and the Janata People's Party came to power. But it did not have any cohesive power. Its leader, Moraji Desai, was more interested in protecting cows, banning alcohol and getting his daily dose of urine than coming to the problems faced by the country. The Janata fell back in 1979 and the 1980 elections brought back the Congress to power. But by then Indira's charisma began to fade due to many communal riots and the upheavals in Punjab. In 1984 her Sikh bodyguards assassinated her. This was in reprisal for her decision to send the army to flush the Sikh radicals from the Golden Temple in Amritsar. Meanwhile, Indira's son Mr. Rajiv Gandhi, an Indian Airlines Pilot became the next heir to the throne and quickly got an overwhelming majority. Under his regime foreign investment and use of modern technology were encouraged. Then he was dogged by the Bofors scandal. Bribes were allegedly paid to members of his government to secure a contract to supply Swedish heavy artillery to the Indian army. 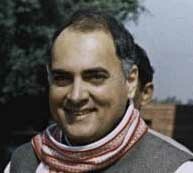 After the November 1989 elections, though Rajiv's party was the single largest one, it was unable to form a new government of its own. As a result, the National Front that constituted many regional parties came to power with V.P Singh as the Prime Minister. It didn't last for long and fresh elections were called for. It was during the election campaign in Tamilnadu, that a Human bomb supposedly carried by an LTTE sympathizer assassinated Raja Gandhi. Meanwhile the septuagenarian Narasimha Rao led the Congress party to victory. The Hindus call this small town in U.P as the birthplace of Rama. During the Mughal rule several of the Hindu temples in the city were destroyed and mosques were built. On one such site was the Babri Masjid before which there was a Hindu temple. In December 1992, rioting followed as Hindu fundamentalists brought down the Babri Masjid. The 1996 elections were a disaster for the Congress, being defeated by the BJP. But that government lasted only for two weeks and was replaced by a coalition of regional parties called the United Front, and headed by Deve Gowda. In April 1997 he was replaced by I.K.Gujral.In the1999 elections the BJP and its allies claimed majority and are ruling the country, with Mr. Atal Behari Vajpayee as the Prime Minister. The current President Kocheri Raman Narayanam is the first Dalit, ever to have held the post.While the Central government is strong, the prospects of regional autonomy are getting brighter day-by-day. There is a lot of consensus on vital issues like liberalization in economy and decentralization of power in administration. The Judiciary has proved many times that it is the watchdog of our Constitution. The fourth Estate is also alert and active. On the brink of the third millennium India is poised for a new area of economic progress and social justice that the Indians are looking forward with a lot of confidence vowing to adjust with nature.